It had been awhile since I placed my last ghost bike in the Valley, but that doesn’t necessarily mean much. Deaths continue to accumulate in Los Angeles and the southland. Knowing our infrastructure, I knew it was just a matter of time. 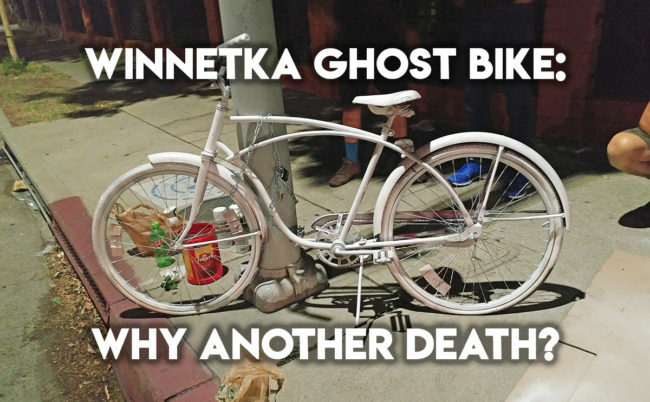 On Monday evening, a man in his early 70’s was killed in the crosswalk on his bike by a driver going northbound on Winnetka at Lanark. Like most roads in the West Valley, this street accommodates high speeds which takes precedent for drivers over obeying posted restrictions. For years, distracted driving, questionable design, bad laws, the limitations of enforcement and entitlements have led this region to be exponentially the deadliest region in the state. Looking at this collision site, there’s very little to differentiate the promise of safety from others. 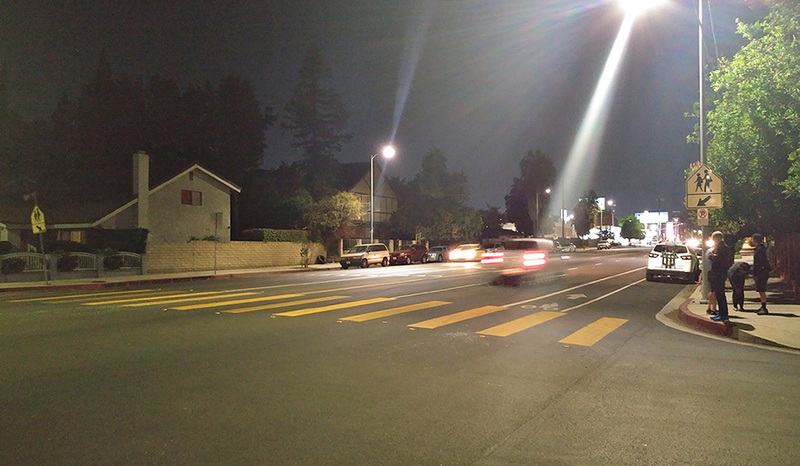 While the crosswalk is wide and yellow indicating its proximity to a school, there’s very little else to make drivers active participants in looking out for others. Other than the signs and the pain, not much to slow down drivers here. Of course, when you sign on to drive a car, this is supposed to be your responsibility, but many feign that and there’s an overwhelming attitude that vehicles own the roadway. The driver in this case did stop after the collision, but this doesn’t elevate her status because we’ll never get the other side of the story. Most people jump to the conclusion that the victim was at fault, as if those who walk or bike are deemed careless already by bothering to risk their lives in the first place. I’m of the other thinking that if you’re crossing a street like this, you’re taking extra precaution getting across, but that’s still not enough with faulty designs and driver habits. Before heading over, my guess about why he got hit is a scenario I see played out many times. The man was starting to go across the street as a driver slowed to yield to him. Behind this first car, the second driver didn’t want to slow down, so she swerved around the first car not knowing if it was clear. Yes, it’s hard to make out and I had to look closely that night. Where my finger is pointing is where the skid marks started with them ending right before the white SUV pictured. 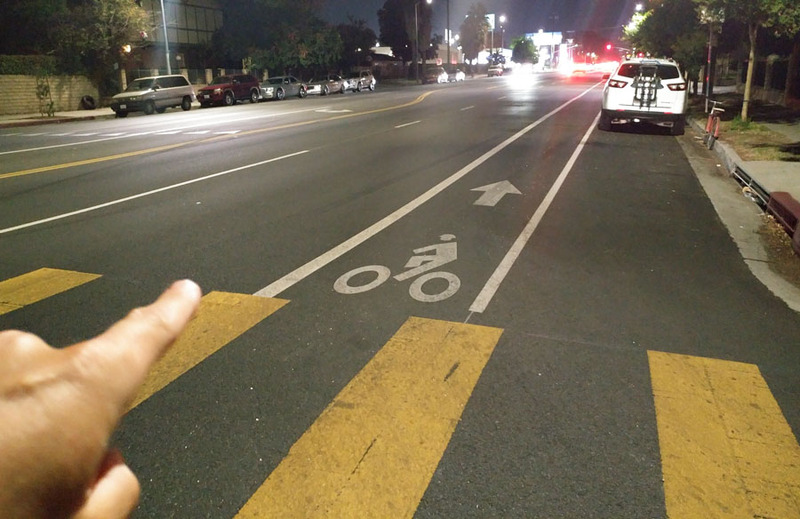 More precisely, I’m pointing to the marks on the left side of the car and you’ll see the right side going through the arrow in the bike lane. If the cyclist was heading eastbound (to the right in the photo), then you could explain the driver trying to veer out of the way, but all accounts show he was headed the other direction. Ask yourself, how else could those slanted skid marks be established? It is difficult to find another explanation for the driver veering out of the #2 lane if she wasn’t whipping around someone. Once again, we’ll just have to be left guessing.